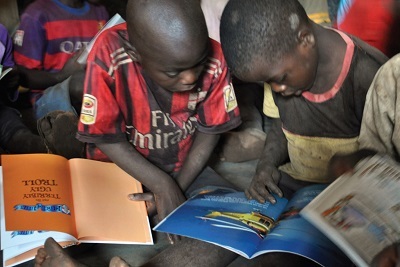 Last year a rural village called Mphako in Malawi received books for the very first time from Book Aid International. Representatives of the Book Aid team were there to join in the celebrations, and see the joy that every book sent by the charity brings. Mphako is one of many places around the world where books are truly rare. Poverty is the norm, and schools are hugely over-crowded and under-resourced. I visited alongside representatives of the Gumbi Education Fund, a UK NGO which focuses on improving the lives of children through access to education and works in the region, to celebrate the opening of a new community library built by the fund. We provided a collection of brand new, carefully selected books for the library, including many children's books. When we arrived, the new library was not difficult to spot, as it was surrounded by a crowd of children. As soon as the doors opened, the children's enthusiasm was irrepressible. They were entranced by the books - gathering together around the pages to look at pictures, talking excitedly to each other. A boy who was utterly transfixed by images of helicopters told me: "I have never seen so many colours. I have never seen pictures like these." As the initial excitement wore off and the children settled down to read, look at pictures or play with touch-and-feel books, I was struck by a sense of déjà vu. While Malawi is a long way from my local library in London, the excitement and wonder on the children's faces as they read would be familiar anywhere in the world. The déjà vu surprised me, but it shouldn't have - after all, a child's reaction to beautiful books full of rich illustrations and imaginative stories is universal. 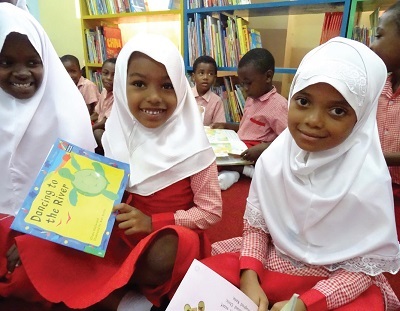 At Book Aid International we send more than one million brand new books every year to people who have limited or no access to books, more than two thirds of which are for children. We cannot visit every one of the thousands of schools, libraries and refugee camps where children are discovering the books we send, but we do know that the challenges that Mphako's children face are not unique. Millions of children around the world do not have books at home, and schools have only a few old tattered textbooks. They are growing up in a world without books. Our charity works for a future when everyone has access to books at every age, but we also know that children's books are especially precious. Childhood is when a lifelong love of reading and learning takes root, and children need books to help them learn to read and succeed in education. As I saw in Mphako, the impact of those books can be immense - particularly when combined with the support of a trained children's librarian. 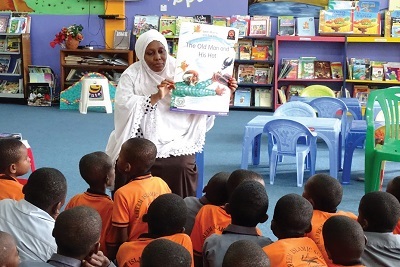 In Tanzania, we recently heard from a father about the impact of the Children's Corner we created in his local library: "We bring the children daily to the library because it is preparing them for school. I have been bringing my three-year-old son to the library daily for five months. I am happy that he can count up to 10 and sing the letters of the alphabet. He is also bold and can relate well with people." In every Children's Corner we train a librarian in how to support young readers and fund the creation of a welcoming space full of murals and comfortable furniture. To date, more than 500,000 children have benefited from a local Children's Corner - but we know that there are still too many children who are growing up without books. 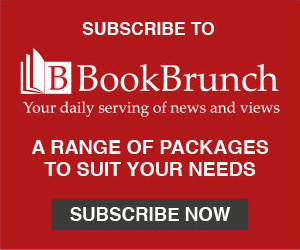 That is why, with the support of our publishing partners who donate every single one of the books we send and the generosity of our donors, we intend to expand our Children's Corner programme and step up our work creating and supporting school libraries. Together, we can reach out to more children around the world, introducing the next generation to the joy and wonder of reading. Photos from top: absorbed in colourful photos of helicopters at the library opening in Mphako, Malawi; story time at Ungunja Library's Children's Corner, Zanzibar; Children's Corner in Pemba Library, Zanzibar. Emma Taylor is head of communications at Book Aid International (www.bookaid.org).